With growing standards of patient care, ever more clinics across the world are driven to change the way they manage their activity. However, nation-wide requirements and regulations, such as Affordable Care Act, are not the only motivation for clinical workflow automation. The core incentive lies in consumers who demand the easiest and the most efficient way to receive care. After reading this article, you’ll find out which solutions can be implemented into a healthcare organization to optimize the clinical workflow. Availability, time, and efficiency – these are three main factors that affect the customer choice and help create better outcomes. That’s why providers are seeking ways to shorten wait times, improve accessibility and empower faster and more meaningful interaction between patient, doctor and clinic management. This leads to re-thinking of the current model and technology that supports it. From doctors’ side, tracking shifts from different sources makes up one of the biggest costs for a clinic, as it affects estimated time spent on a patient, the number of patients a day, and thus, leads to inconsistencies in payroll management. From patients’ side, disorganized patient flow leads to chaotic queues – first come, first serve. 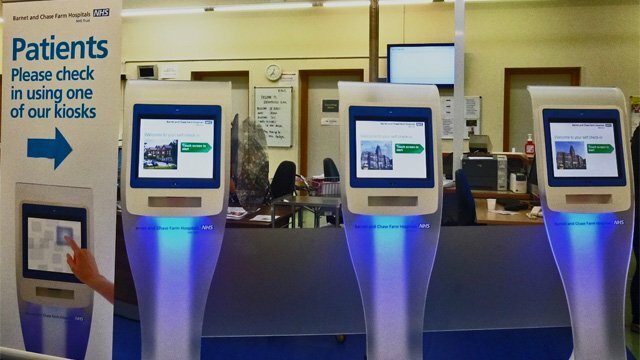 With appointment scheduling and electronic queueing processes united into a single centralized scheduling system, benefits come from both sides: the system automatically accommodates each doctor’s workflow and distributes patient queues considering multiple sources: online scheduling, check-in counters, and reception desks. As a result, patients come to the arranged time and wait for their appointment without queueing in front of a doctor’s door. It’s logical that the next step patient makes after successful check-in to the hospital is attending the doctor. What does happen there? A doctor logs in to the practice management system, where he has access to the electronic medical record of the specific patient. Here’s where they create, view and manage records, fill in the information, add notes, photos, documents, and even order medicals sending a request to pharmacist’s (which can also be a part of clinical workflow automation system). Digital transformation is pushing old-school clinic management systems to their limits. 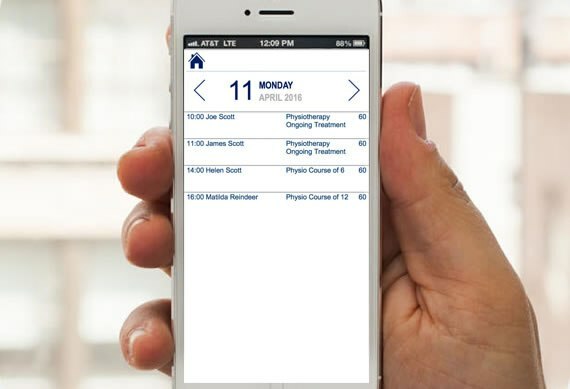 In the highly connected world, people are becoming more knowledgeable about their health thanks to the mHealth solutions, from nutrition tracking apps to IoT connected health devices such as telecare devices. That’s why remote monitoring and so-called BYOD approach is becoming an integral part of practice management and contributes to clinical workflow automation, as it eliminates the long process of patients’ questioning and allows the doctor to gather comprehensive health data of each patient. 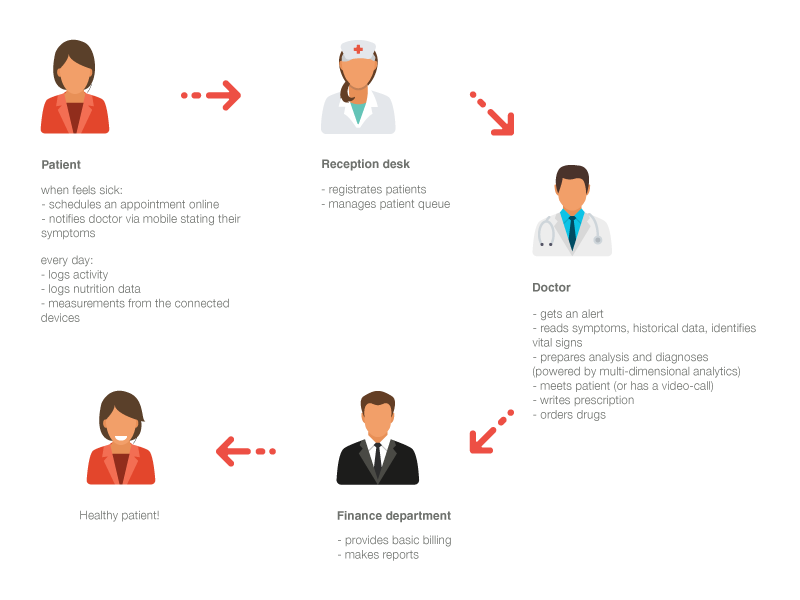 The workflow is the following: a patient logs activities, nutrition, feeds measurements, books appointment and, reports symptoms before visiting doctors. All this data is being synchronised with the centralized clinical management system and is added to a patient’s record. This helps the doctor get an extended overview of the current state of the patient and offer tailored care. Remote monitoring also adds to the automation providing the ability to consult through video, messengers, or even with the help of chatbots and multi-dimensional AI-powered analytics. The role of document management in a workflow of a clinic is crucial, as even now, some doctors are writing the notes on the appointment results and following treatment for hours and each time they need to alter the way they present the information. Even if the clinic has their online document management system, together with dozens of other IT systems, they may suffer from the disparate terminology issues. To achieve the consistent content and organized terminology, as well as customizability of documents, the centralized document management system is a must-have. A good example of document management solution is functionality developed for healthcare CRM by Elinext team. It is an HTML-form that allows doctors to build custom documents, consent forms and application forms with unique styles and over 5000 custom fields available upon payment. This allowed the clinic to maintain the homogeneous in-house style of the document and at the same time make them unique and consistent. Strict regulatory requirements have touched the final part of the clinical workflow – billing, reporting, and insurance. A well-organized clinic workflow management system should cover these two needs of financial managers: first, it should ensure medical billing with integrated payment processing and predictive analytics allowing to increase revenue and cash flow. Second, finance reps should be able to generate reports from multiple information sources and store them all in a central repository. Based on this, and with the help of analytical tools, they can measure patterns of disease, allocate doctors and manage material resources. Having considered all these processes when creating workflow management solution, you get a centralized agile and flexible system, with globally standardized records and processes, which improves customer satisfaction and adds to speed and quality of provided healthcare services. Doctors get access to the right fact-checked information at the point of care, which allows for fast and quality decision making, saves time and ensures the consistency of treatment. Patients receive tailored care, contributes to their own treatment and benefit from streamlined scheduling. Finance use comprehensive billing and reporting system to manage finances, reduce administration time and improve cash flow. Security: Healthcare data has become very valuable to cybercriminals; having a robust security strategy is essential. We comply with all the security and data protection requirements. Quality: We avoid the loss of patient data, delayed diagnosis, treatment, duplication of exams that can affect the care of the quality of services provided. Flexibility: We can create the scalable system that consists of several modules customized to the needs of each user. Any third-party integrations are also available. Innovation: Elinext stands for innovation and always offers our customers innovative features and technologies – from telehealth solutions to blockchain and speech recognition. Contact us and get the professional consultancy and audit of your existing clinic management systems.